The Fr. 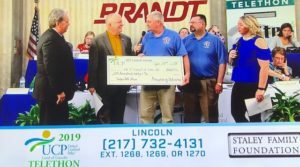 Augustine Tolton Knights of Columbus Council 16126 donated a check for $660.27 during their telethon today with funds collected from our annual Individuals with Disabilities Campaign, AKA, “Tootsie Roll Drive” which we held in the fall at White Oaks Mall. Thank you to everyone who supported from the Cathedral community! In the photo from the council is Grand Knight Kevin Keen and Trustee Stephen Williamson.